Torque wheel nuts to proper specifications (recommended ft/lb). Place one Wheel-Check® over each nut with the raised collar towards the wheel. 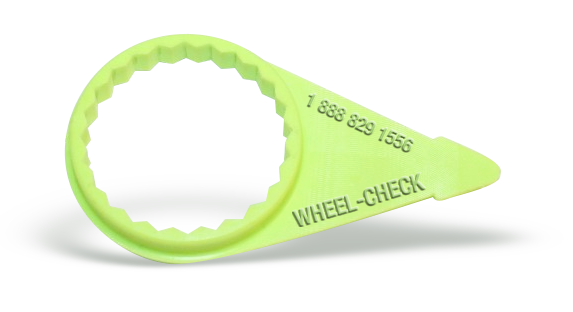 Wheel-Check® name, number and size should be facing out. Hold the arrow of the indicator pointing in your preferred pattern. 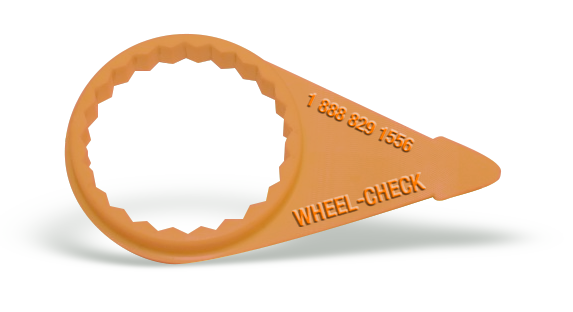 Push the Wheel-Checks on with a socket wrench or a PVC pipe. It’s that easy, no other tools required. * (diagram 2). For disc wheel, point the point to the center following stud (photo 1). For other wheel types (spoke pattern), point indicators towards the hub (photos 2 and 3). * STEP #3 IS VERY IMPORTANT FOR CORRECT INSTALLATION. THE DRIVER WILL DO THEIR WALK-AROUNDS BY LAW. If a nut has backed off as little as 50 ft-lb, the driver can notice if he observes closely. Once the nut has backed off 100 ft-lb, the movement is easily noticeable. INSTALLATION OF RED WHEEL-TORQUES. If the driver notices a nut has moved, the driver would remove the yellow Wheel-Check®, retorque the loose nut and then replace with a red Wheel-Torque. This would identify the loose nut to the maintenance shop at a simple glance and they will know that the whole wheel must be carefully serviced. 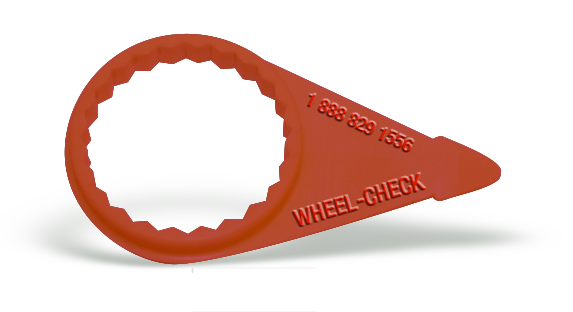 Wheel-Check® is an indicator and must always be visually checked when a driver is leaving or getting into his truck. Please call 888-829-1556 with any questions or concerns. 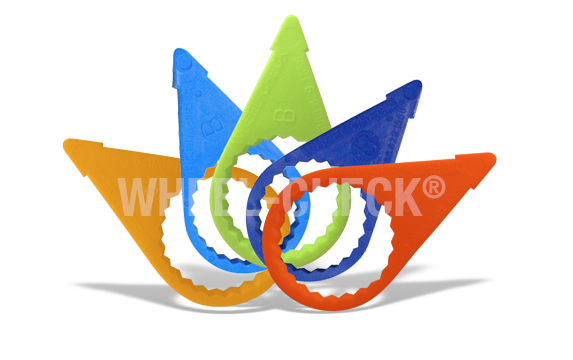 The use of Wheel-Check® in no way guarantees wheel-offs will not occur. High temperature Wheel-Checks are available.